From the author of the New York Times bestseller Eleanor & Park. 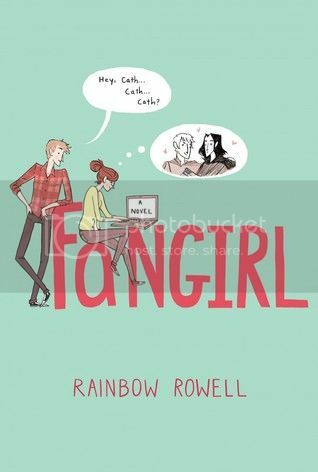 Fangirl is the second book I’ve read by the insanely talented Rainbow Rowell. Everyone said that I would enjoy this book even more than I did Eleanor & Park. I was a bit skeptical about this, but everyone was totally right! This book was SO great, and I am thrilled to have it be the first book that I’ve read and reviewed in 2014! The main character in the story is Cath. Cath is sarcastic and introverted and a huge fan-fiction fanatic. I love Cath. She is probably the most relatable character that I have ever met in all the books that I’ve read. She is so much like me, it’s kind of scary! But that is why I love her. With all of the things that went on in her past, and everything that she was experiencing in her present, you couldn’t help but feel something for her. Yes, she was crazy awkward and naïve at times, and I guess that is why I was so able to relate to her. I love the relationship between Cath and Levi. I love their interactions with each other and that their relationship was one that was built gradually, instead of instantly. They were really great together, and I could totally see Cath coming out of her shell and becoming such a stronger person with Levi’s help. Levi, by the way, is totally swoon-worthy. Just so you know. One of my most favorite quotes from the book would have to be from dear Cath. - “There are other people on the Internet. It's awesome. You get all the benefits of 'other people' without the body odor and the eye contact.” Yes! Best introverted quote ever! I loved all of the secondary characters to the story just as much as I loved the main character. Cath’s roommate, Reagan, was someone that I didn’t expect to really like in the beginning, but I adored her by the end. I felt the same with Cath’s twin sister, Reagan… although I didn’t like her nearly as much as Cath. Cath’s father was definitely an interesting parent, and I worried that he might be one of those parents in YA books that I was really going to be disappointed with, but he wasn’t. I could go on and on about the characters in this book. But you should just read it so you can meet them yourself! At 448 pages, I thought that this book would be something I would read over time and enjoy. Instead, I was sucked into the story and flew through the pages faster than I ever imagined. The story and characters blend together to make this book a captivating read. This book made me laugh so much, and even had me tear up a few times. It was such a great read. Overall; I enjoyed this book so very much more than I expected to, and yes, even more than Eleanor & Park. If you haven’t read anything by Rainbow Rowell yet, I definitely recommend you adding this book to your reading list. It’s definitely worth the read. What a great way to kick off the new year! I adore this book beyond reason. Introverts FTW. I loved this book so much and I enjoy reading all the reviews of it - it's so great when people love the books you love. :) I agreed with everything you said about it! I haven't read Eleanor and Park yet, but I have a feeling I won't like it as much as this, because I think I relate more to the characters in Fangirl. Great review! yet another fantastic review for this book. I got a copy of it for christmas, so I can't wait to read it. I am a little nervous that my expectations will be too high since everyone loves it so much. but it looks awesome. I can't wait to get to know Cath. I'm so glad you liked this one! It was my favorite book of 2013 and I just think it's so special. What a great way to start off your 2014! Rainbow Rowell seriously is so talented, isn't she?!? I loved this story -- and might need a reread of it soon. Fabulous. I ordered this book and it's on the way, it's my first Rainbow Rowell book, I thought I would try it and then attempt Eleanor & Park. Soo glad you liked it, your review makes me want to read it even more!! RIGHT? I was absolutely not expecting to like this book at all! I was literally in the most grumpy mood, downloading it to my Kindle. Then I started reading. AND FELL IN LOVE INSTANTLY!!! So good!! I have not read a book as umm...mind-opening and as beautiful as Fangirl! I can't wait to read Rainbow Rowell's other books! First of 2014 for you, final of 2013 for me. Go us! I emphasized so much with Cath! That's really such a great quote...excellent choice, lol! I'm also a fan of that ending! I'm so glad to see you loved this, and what a way to kick off 2014! I agree, Cath is probably the most relatable character I've ever read!